Computer Repair Sacramento – Knowledge Base: How to perform a Windows NSLookup MX Record Lookup to verify MX records for domain. 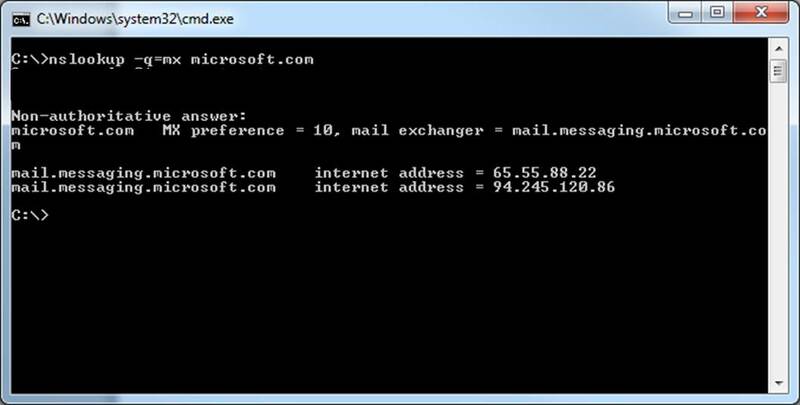 TIP: The MX (Mail Exchanger) record is a type of resource record in the domain name system. When an email is sent to you, the MX records specify where the email should be routed to reach the email server for a specific domain and ultimately end up in your inbox. There are numerous Internet websites you can use to a MX record lookup online. I prefer MXToolbox. But, all you need to do a simple nslookup MX query or verify MX records for a domain is one easy to use tool built into Window, and you can do the task much quicker and easier. mx – The nslookup query type value, in this case mx or mail exchanger. MX Preference: Mail Exchanger server priority. Lower numbers have higher priority. Under that, the address(es) are listed. Easy, isn’t it? No need to fire up a browser and search for an online nslookup service, just use the command prompt in Windows and the built in nslookup mx query tool. Need help troubleshooting and resolving email or network issues? For help with Windows NSLookup MX record lookup or other network related issues, contact Jonathan – Computer Networking Sacramento today! Jonathan Warner is a Technical Support Specialist who enjoys helping others with their technology needs. You can contact Jonathan by phone at (916) 469-5669 or email. Over the past 15 years, Jonathan has been honing his computer repair skills; if you need help, contact him today!